Gamification is being used by brands to stimulate interest and increase engagement of its customers. Some brands are opting to create highly sophisticated apps that have a practical application while others like M&M’s chose to include game like aspects into a larger marketing campaign. This case study looks at how M&M’s did the latter incorporating gamification into the launch of a new flavour of sweets. In 2010 M&Ms launched a pretzel-flavoured version of its popular confectionery brand. Three years after the initial launch the brand wanted to further promote the flavour. In order to promote M&M’s pretzel products, the company launched a huge marketing campaign which included a successful eye spy game. M&Ms incorporated an inexpensive but highly valuable game into the campaign promoting M&M’s pretzel products. 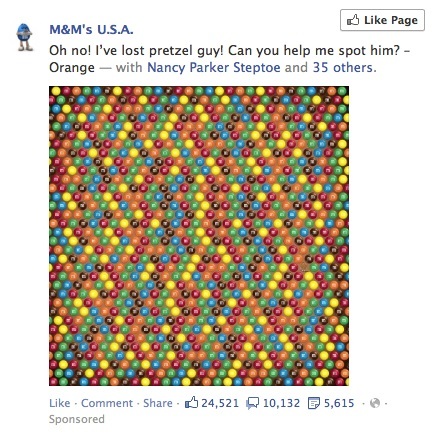 The simple cost-effective game consisted of an image of M&M’s and one small pretzel which users had to find. The simple game bought tangible benefits to the campaign, including fostering user engagement with the brand. As well as this it bought huge gains to M&M’s including 25,000 new likes on the brand’s Facebook page as well as 6,000 shares and 10,000 comments. The game provided a fun way for fans to engage with the brand and spread the word on social media.